The all-new GMC Acadia may look like a sport utility vehicle, but this is one of those cases in which looks deceive. The Acadia has many of the capabilities of an SUV but it is aimed at people who want better ride and handling. The Acadia is what the auto industry calls a “crossover,” which means despite its looks it uses car-type construction and mechanical components instead of the trucky parts used in traditional SUVs. Acadia shares those components with its siblings, the 2007 Saturn Outlook and the 2008 Buick Enclave. 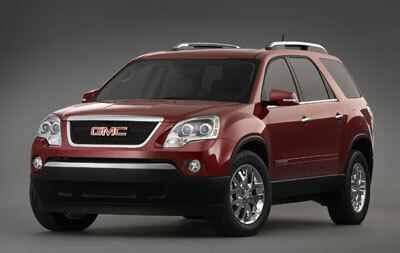 Head down a curved, country road and it is easy to see GMC achieved its goals with the Acadia. It eases over rough pavement in a soothing manner but takes corners in a reassuring fashion, although the driver is always aware that this is a relatively large and heavy vehicle. Meanwhile, a sophisticated 275-hp 3.6-liter V6 provide smooth and readily available acceleration and a new six-speed automatic transmission helps fuel economy. In addition, all Acadias come loaded with standard safety equipment including proven lifesavers such as electronic stability control and air bags that provide head protection in a side-impact crash. Three rows of seats provide room for seven or eight, although that assumes an extremely chummy trip. But two adults and two or three children and many of their favorite belongings could be carried with ease. The standard Acadia has front-wheel drive but all-wheel drive is available so the Acadia offers the same bad-weather security as classic SUVs. Where it falls behind a classic SUV is in towing capacity or the ability to handle a serious, off-road chore. But for most people that won't matter a bit. For most people, the Acadia is an interesting and attractive alternative. The 2007 GMC Acadia comes in three trim levels, starting with the SLE followed by the SLT1 and SLT2. Each is available in front-wheel drive or all-wheel drive. Standard equipment on the SLE includes air conditioning; cruise control; tilt and telescope steering wheel; heated, outside mirrors; power windows and door locks; OnStar; four-way, manual adjustable driver's seat; AM/FM/compact disc player; auto-on headlamps; daytime running lights; rear window wiper and seven-passenger seating. Options include eight-passenger seating ($495); rear-seat entertainment/DVD player; convenience package with remote start and ultrasonic rear parking assist ($435); two-panel Skyscape sunroof ($1,300); head-up display ($350); 19-inch aluminum wheels ($695); power liftgate ($350). Safety features include air curtains, seat-mounted side-impact airbags for driver and front-seat passenger, OnStar, anti-lock brakes, and StabiliTrak electronic stability control. All-wheel drive is available for more secure grip in foul weather. Air curtains are low-pressure air bags that come down from the ceiling and cover the side windows (of all three rows) to provide head protection in a side-impact crash or rollover; in a rollover the air curtains could help keep arms and heads inside the vehicle in addition to providing head protection. However, air curtains are not a substitute for seat belts. Studies by the Insurance Institute for Highway Safety, which is funded by the insurance industry, have shown such head protection greatly improves the chance of surviving a side-impact crash. The front-seat side-impact airbags provide chest protection in a side-impact crash. Institute studies have also shown these “torso bags” are valuable, but not as valuable as head protection. OnStar uses a global positioning system and an extra powerful cellular telephone to put the driver in touch with the OnStar center which is manned 24/7. The center can tell where the vehicle is located and send help or provide other assistance. Should the air bags deploy the system can automatically notify the OnStar center of an accident and where the vehicle is located so it can then send help. Initially OnStar help is free but eventually there are subscription charges. The exterior design team for the GMC Acadia managed to give a relatively large vehicle a look that has moved away from bulky without sacrificing a kind of active grace. Happily GMC has avoided the threatening-SUV school of design that seems so popular with some manufacturers. With an overall length of about 201 inches the Acadia is slightly longer than two major competitors, the Honda Pilot and Ford Explorer. A few years ago General Motors officials acknowledged (not like they had a choice) that the interiors of many of its vehicles need to be upgraded, banishing cheap-looking plastic and bargain-basement cloth. That effort shows in the Acadia. Indeed, the interior had a handsome and upscale look in the fancy SLT2 model we drove. Meanwhile, GM did not lose track of basic functionality. The heating and cooling controls are easy to find and use. The instruments are legible, not lost in some fussy attempt at a complex design. Big cupholders and a deep bin between the front seats are a plus but the storage pockets on the side doors are too narrow for any meaningful storage. The front seats are wide and comfortable and a tilt and telescoping steering wheel makes it easy for drivers tall and short to get comfortable. As with an SUV the driver sits high with a good look down the road. But visibility to the rear isn't great, requiring care when backing up. An optional feature to ease that problem is an ultrasonic rear park assist system that can detect objects out of the driver's line of sight. The standard seating arrangement is for seven, which includes two captain's chairs in the second row (with three people in the third row and two in the front seats). Those who want eight-passenger capacity get a split, bench seat for the second row that accommodates three. GM says the second row has a maximum of 36.9 inches of leg room, which is comparable to the Pilot and Explorer. To provide a little more flexibility the Acadia's second row slides fore and aft a total of four inches. Its 36.9 inches of legroom is measured with the seat roughly in the middle of the four inches, GM says. With the second row in the rearward-most position a six-foot adult can be comfortable in the driver's seat and another six-foot adult can be seated directly behind without being cramped. Getting to the third row involves using what GM calls a Smart Slide feature. It is a handle that is designed to move the second row up and out of the way. On the model we tried, which was an early Acadia built by GM for testing and not quite ready for sale to the public, the handle was balky. A GM spokeswoman said that problem will be solved on the models headed to dealerships in December. Nevertheless, it would be a good thing to check at the dealership before making a purchase. As in most vehicles the third row is best suited for small children. But here is the fine print when GMC says the Acadia is a seven or eight-passenger vehicle: GM assumes three people are sitting in the third row which has about nine inches less hip room than the second row. Putting three people back there will be a tight fit even for small children. The Acadia really triumphs in cargo capacity, according to manufacturers' measurements. It has almost 20 cubic feet of cargo space behind the third row, more than the trunk space of a mid-size sedan. That compares to almost 16 cubic feet for the Pilot and almost 14 cubic feet for the Explorer. (Typically automakers make those calculations filling the space to the roof, blocking the rearward view.) A small plastic-lined bin below the floor of the Acadia's cargo compartment is perfect for carrying messy stuff. The third row folds down easily and a strap is used to pull it back up. It is not an upper-body workout but does require some effort. With that third row folded down the Acadia's cargo-carrying advantage continues with almost 69 cubic feet of space. That compares to about 44 cubic feet for the Explorer and almost 48 cubic feet for the Pilot. One nice feature is that lowering the second or third rows on the Acadia does not require removing the head restraints. When the second and third rows are folded the cargo area is almost flat. The GMC Acadia is a fairly large and heavy vehicle but the engineers have done a good job of concealing its size when it comes to driving. The steering isn't so heavy that any serious effort is required, even in a parking lot, but it offers enough weight that it doesn't feel disconnected either. So, it quickly gives the driver a feeling of confidence about where the vehicle is heading and how it will respond. The Acadia uses an independent suspension in the front and rear, just like most cars. It provides a well-rounded blend of ride and handling. Bumps, tar strips and potholes are still felt but only distantly, without the slam-bam jarring that is part of life with a truck-based SUV. The body also feels strong and doesn't quiver with each blow. But despite the pleasing ride the body motions are still nicely controlled so there isn't a sloppy feeling. There is no denying that the Acadia is a relatively large and quite heavy vehicle, with the curb weight of the all-wheel drive model we tested being almost 5,000 pounds. That is several hundred pounds more than a Ford Explorer V8 and about 500 pounds more than a Honda Pilot. But the Acadia still heads into a turn fairly quickly and feels locked-down stable during interstate cruising. In the past many GM trucks had a soft, squishy feel to the brake pedal. That is not the case with the Acadia. It feels firm makes it equally easy to shave off a lot or a little speed. The best safety feature is the ability to avoid accidents, which in the Acadia's case is helped by StabiliTrak, GM's brand name for electronic stability control. The system uses sensors to tell if the front or rear of the vehicle is sliding in a direction that is at odds with what the driver is doing with the steering wheel. Then, it tries to correct for the skid. The Acadia is available in front-wheel drive or all-wheel drive. The all-wheel drive system is permanently engaged and does not require the driver to do anything but drive. Those who wonder whether a V6 is enough to handle such a big vehicle have a valid concern, but this is a new V6 with variable-valve timing designed to make it more powerful, efficient and flexible. The V6 is rated at 275 hp at 6600 rpm and 251 pound-feet of torque at 3200 rpm. That is more than the Pilot's 244 hp and approaches the 292 hp in the Explorer's V8, while the Explorer's V6 is rated at 210 hp. In addition, the Acadia gets a new six-speed automatic transmission. The Pilot and V6 Explorer use five-speed automatics, though the V8 Explorer gets a six-speed. The additional gear means smart engineers can make the vehicle respond more quickly to the gas pedal while also providing better fuel economy than in a vehicle with fewer gears. We found the Acadia's powertrain impressive. The six-speed automatic was quick to downshift while upshifts weren't jerky. Acceleration was more than adequate with one or two adults and the 3.6-liter V6 seemed smoother than the new 3.5-liter V6 Ford has just introduced. However, we never had the chance to load the Acadia up with seven people. The Acadia clobbers the Pilot and Explorer when it comes to estimated fuel economy, according to the federal government's Environmental Protection Agency. The EPA estimates the Acadia all-wheel drive we tested will get 17/24 mpg City/Highway. The two-wheel-drive Acadia is rated 18/26 mpg. GM recommends 87-octane Regular gas. That compares to 15/20 mpg for the Explorer V6 4WD, 14/20 mpg for the Explorer V8 4WD, and 17/22 for the Honda Pilot 4WD. It is no small trick to combine functionality, polish and a good load of safety equipment at a reasonable starting price. But that's precisely what GM has done with the all-new GMC Acadia. Christopher Jensen filed this report to NewCarTestDrive.com from New Hampshire. Head/hip/leg room, f: 40.4/57.8/41.3 in. Head/hip/leg room, m: 39.3/57.9/36.9 in. Head/hip/leg room, r: 38.4/48.3/33.2 in. Cargo volume: 119.9 cu. ft.